Razorback RateReceive 15% off Begin your tour of the University of Arkansas from Fayetteville's best view: the lawn of Old Main. You don't have to be a Razorback to lock-in our Razorback rate, stunning views of Old Main included! Enjoy 15% off your stay at the Inn at Carnall Hall when you book 14 days in advance. Perfectly positioned on the cornerstone of campus, there's no better way to get to know your home away from home. For new reservations only. Blackout dates may apply. Does not include University of Arkansas home football games. Rates and availability subject to change. Cannot be combined with other offer. Must book 14 days in advance to receive discount. Fuel up for a fun day exploring the University of Arkansas. Gourmet GetawayDinner, drinks & more Enjoy a full spread of breakfasts, dinners, drinks and snacks. 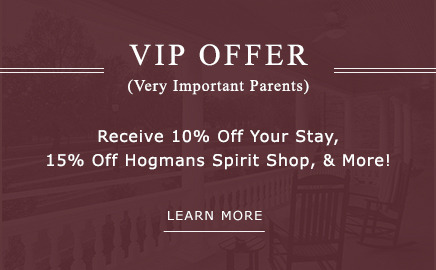 Very Important Parents are our special VIP guests who will receive 10% off their stay, a dining credit and discounted merchandise. Relish Southern fine dining with a twist, crafted with the freshest locally-sourced fare at Ella’s Restaurant. Celebrate a Razorback victory or host a get together with old college friends in our Lambeth Lounge bar, a social hotspot in a laid-back Southern setting. Walk to Fayetteville’s buzzing art, entertainment, and dining strip on Dickson Street, Fayetteville Square, and the Razorback Stadium just across campus. Guests love our gracious Southern charm and quintessential Southern traditions like front porch sittin’ and sippin’ sweet tea on our wraparound porches.